In an Iwagumi layout, only one type of rock is used as a composition material, and generally only a few types of aquatic plants are planted in a simple arrangement. Due to this simple composition, the strength of the presence of the rocks and their overall impression are influenced greatly by the arrangement of aquatic plants and the denseness of their growth. Therefore, the selection of the aquatic plants and the timing of their trimming are very important. Because of the strong presence of rocks, it is important to keep the rocks clean as well. 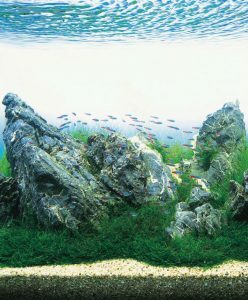 In an iwagumi layout, the rock arrangement can be left intact while plants are rearranged. With the above considerations in mind, let’s explore the maintenance of the iwagumi layout over time. 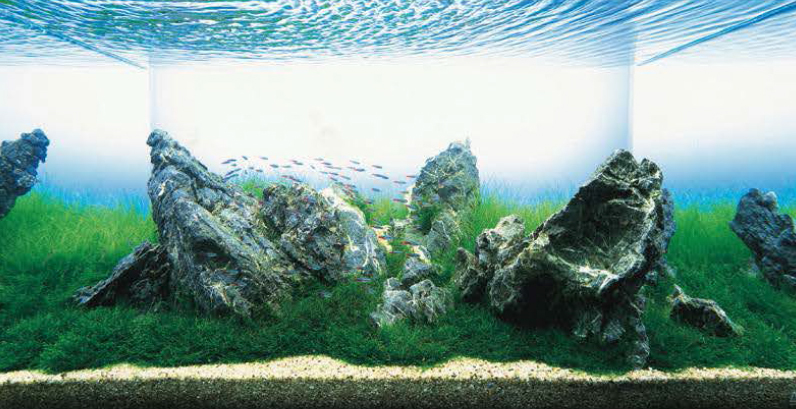 In an iwagumi layout, if the rocks are hidden by aquatic plants, the presence of the rocks becomes weak, and the balance of the rock arrangement and the intention of the expression-such as the flow of water- become unclear. Therefore, aquatic plants that tend to grow tall should not be used, at least in front of rocks. It is the smaller plants, such as Glossostigma and Cuba pearl grass, that are suitable for planting in front of rocks. l sometimes plant somewhat taller plants such as hair grass and Echinodorus tenellus behind or around rocks. Besides these plants, I sometimes use willow moss in an arrangement by wrapping them around small stones. These aquatic plants are suitable not only due to their smaller sizes, but also their resilience against repeated trimming. Although Glossostigma and Cuba pearl grass are small plants, they can form thick mats as they grow and hide small rocks from the view. And aside from the problem of the small rocks being obscured, if the mat becomes too thick, it overpowers the overall layout as well. 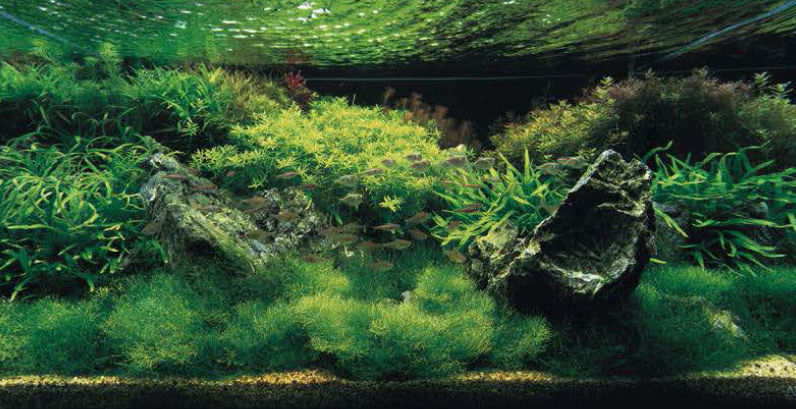 Therefore periodic trimming and replanting become necessary to maintain an iwagumi layout according to its desired image. First, these aquatic plants are trimmed horizontally across the substrate using specialized trimming scissors (the type with curved blades is easjer for this task), leaving a thin mat of runners and leaves. This type of trimming will suffice in the beginning. However, with repeated trimming, their roots tend to lift from the substrate and they stop developing new leaves quickly. When this happens, apply a powder-type enriched soil that matches the substrate type thinly over the plant. A fine, powder-type soil will get in between roots and runners and the plants will start growing vigorously again. This method is effective for rejuvenating hair grass and Cuba pearl grass as well. If this method does not improve the growth of aquatic plants, it is necessary to take out and replant the aquatic plants. Replacing the surface layer of the nutritive soil substrate with new soil at this point encourages plants to grow vigorously again. Since rock arrangement is very solid in the case of an iwagumi layout, it is easy to partially replace the substrate and replant aquatic plants. The layout introduced here was completely revamped to a layout with a totally different impression by changing out the aquatic plants during replanting. In the Nature Aquarium style, this type of a planting change is called sozo haisholm (creative plant arrangement). The layout before sozo haishoku is planted with short aquatic plants to enhance the texture of the prominent seiryu-seki stones. Hair grass and willow moss were maintained with repeated trimming. In the layout after sozo haishoku, willow moss was replaced with Riccia and the hair grass behind the rocks was replaced with stem plants. The presence of the rocks became less imposing and the layout was transformed to a layout with a bright and colorful impression.